The Red Ram Motel on North National Avenue near U.S. Hwy. 54. 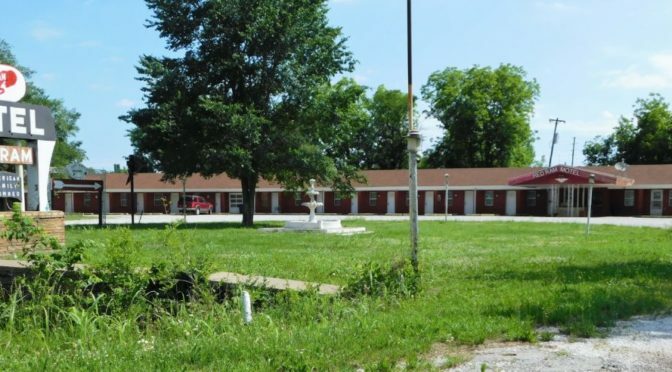 Fort Scott Community College closed on the purchase of the Red Ram Motel, 701 N. National Avenue, on May 30, 2018, for $90,000. “The Patel’s (the former owners of the motel) donated $20,000 to the FSCC Endowment Fund,” FSCC President Alysia Johnston said. The FSCC plan is to repurpose and clean up the property to be used for student housing for the college, according to Johnston. The property will become a part of the campus and therefore tax exempt. When complete, the new student housing will be called the Greyhound Lodge. “We are getting a code footprint on it by Ag Engineering (Uniontown), when that is done we will send it to the state and the city,” Johnston said. Currently, the college is taking bids for cleaning the property of trees and other unwanted items, she said. “We had at least three people interested in the Red Ram Motel sign,” Johnston said. “Rhonda Dunn (Fort Scott’s Community Development Director) suggested using it for a fundraiser. There are 21 units at the lodge, with the possibility of 42 students. Each room will have a small refrigerator and microwave oven. Students can still purchase a modified meal plan if they will be eating on campus, which is across town to the south of the lodge property. A two-bedroom apartment on the property will be remodeled for an assistant coach to live in for security and supervision duties, she said. The current lobby area will be turned into a computer lab. Behind the lab will be a student laundry facility and behind that will be a student lounge with adjacent student kitchen. The old swimming pool area will be converted into an outdoor eating area complete with grills, a gazebo, and picnic tables, Johnston said. “The cost to students will be $300 per month, which includes everything except food,” Johnston said. The lodge is expected to be ready for students in mid-August, Johnston said. Very interesting project, good use of the space!